The Stackt Container Market is the city’s first-ever shopping and dining destination made entirely out of shipping containers. 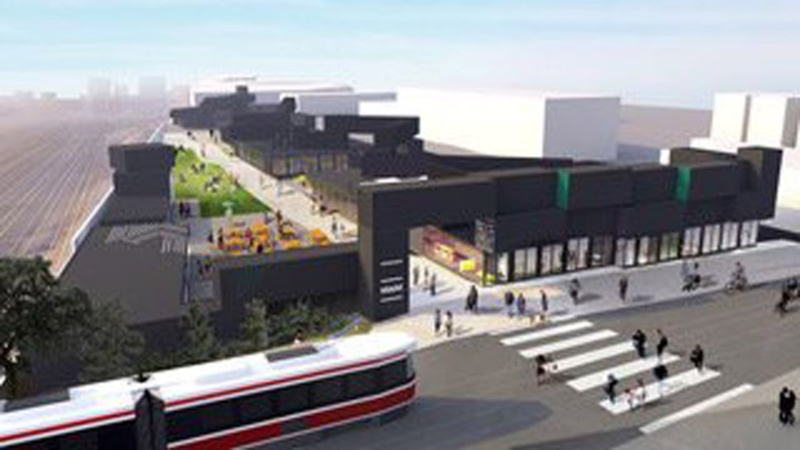 The two-level market occupies a massive area on King Street West (Toronto), and will be home to tons of pop-up shops, restaurants and artist spaces. 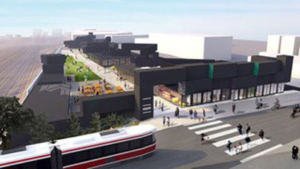 The now-vacant 100,000-square-foot lot at Bathurst and Front Streets in Toronto that was used by a slaughterhouse until 2014, and previously housed a smelting plant, has been an unpopular (and smelly) mainstay of its southwest downtown neighborhood for decades. 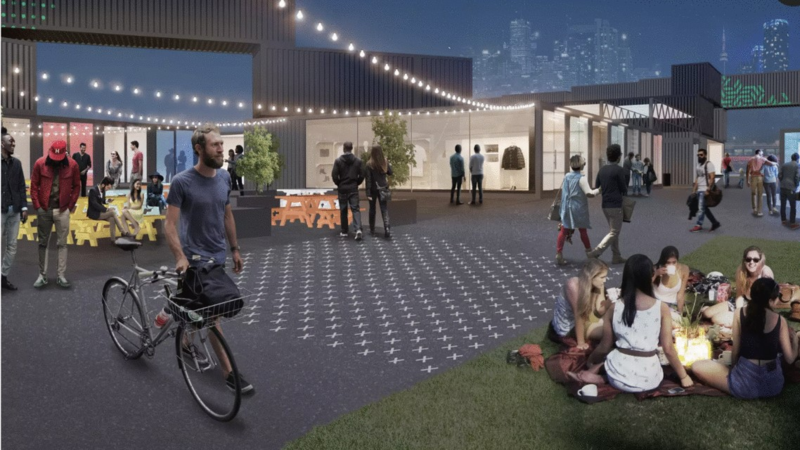 Shipping containers can be outfitted for retail, office or meeting purposes, and combined to make larger spaces. For aesthetic and architectural purposes, they can also be stacked like blocks to create interesting and appealing structures. How do you heat a container? ThermaRay was approached to help engineer the heating solution. These are containers after all with little to no insulation, no floor space for heaters of any kind. The only option is an electric ceiling radiant heating system. ThermaRay’s AS 2×4 heaters have the highest level and best grade of insulation in the industry which results in a much more efficient heater. By placing them on the ceiling, it maximizes floor and wall space. Radiant heating technology is highly effective in this case by providing heat where it is needed. After working with the engineers, a proper mounting method was agreed upon and the number of units were determined. Not only was the heating problem solved but it solves a space challenge as well. Don’t expect to get this type of engineering support from an on-line retailer. You’d be on your own. Is natural gas a safe heating solution? Not so much. 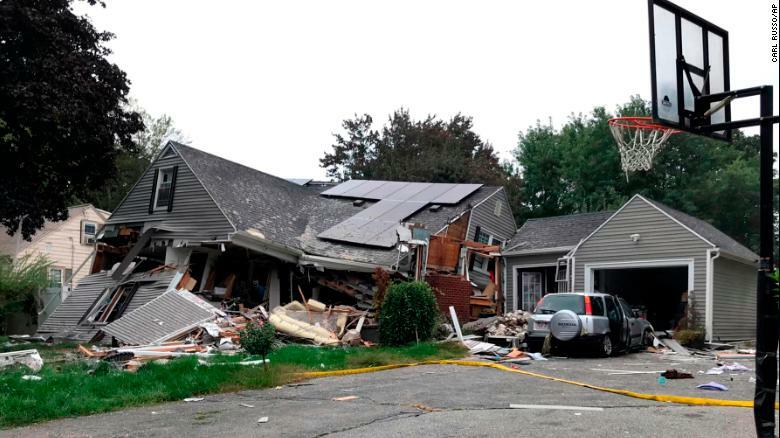 Here’s an article about a natural gas event that saw three towns in Massachusetts evacuated and several homes destroyed due to an accident. A residence in Lawrence, Massachusetts is reduced mostly to rubble Thursday after a series of explosions. Today we’re going to install an Earth Thermal Storage system made by ThermaRay. What it is is a Teflon coated nichrome wire embedded in sheetrock and this sheetrock keeps the wires pre-spaced and it makes it easy for installation. Every panel has two wires coming out the ends of the panel so what we do is the wires come out where the labels at here so we want to take a non-sharp edge and break the paper. Get the wires out of the panel. There’s two wires a black and a red and those are our lead wires. They go to our heating element wires. To make our connection, they simply just slip over the 12 gauge USE direct bury wire. It’s a double tumbler connection so we put the feed wire into that window, pull down with a lineman pliers, and that’s our connection. After we’ve completed wiring a circuit we have to ohm test and make sure everything is hooked up properly so that it’ll run once you get the sand and the concrete over the top. Once you get a good ohm reading, then you can close up the connection cover. So we put the connections directly in the center, wires coming out the end, close that up and now you have a completely waterproof connection. There’s a fastener line where it shows you can put a screw safely without hitting any of the wires. Make sure you hit the line when you put the screw in to hold the strap in place. You’re done. ThermaRay representative will help you determine what you will need for your project. Whether it’s a small addition or 100,000 square foot manufacturing facility. The quantity of heating panels required for any space varies depending on things such as R-values, windows, doors, dimensions and actually how you want to use the space. Once all the gel caps are in place, six to eight inches of sand is placed over the top of the heating panels that can be compacted and it’s ready for concrete. You’ll have a floor heating system that will last through the life of your building. Thanks for watching! Keep up-to-date with any of our videos by hitting subscribe. Kevin Kilbride has a question he likes to ask developers, builders and regular folks alike: Does heat rise? Most people say yes. But as Kilbride explains, it’s the hot air that rises—not the heat. Our brokers found Design Ready Controls, they are our client for this building. They wanted to own their own building, so we sold them the land and we’re constructing the building for them. They are familiar with heating and cooling systems and they wanted to explore what we have to offer. Do You Really Love Grandma? About five years ago, my Dad passed away. His health had been deteriorating for years and he passed quickly after breaking a hip. He never made it home after the surgery, but the drugs made him quite entertaining for the nurses those last couple of weeks. Mom has always been independent, but my wife and I didn’t think she should be living alone in her late 70’s. The three of us set out to merge two households of furniture into one and find a rhythm that wouldn’t disrupt any of the life patterns each of us had developed over the decades. Five years after opening their first hot yoga studio in Scranton, Pennsylvania, Steamtown Yoga owners Lara and John Alexiou had grown beyond their original location and were preparing to open a new facility in July 2013. How Does Radiant Heat Stack Up Against the Alternatives? Why is Electric Radiant Heat Less Expensive? Our electric radiant heating systems are 15% less expensive than Hot Water Baseboard, 43% less expensive than Oil Hot Air, 52% less expensive than Heat Pump and 56% less expensive than Hydronic Oil. The savings continue due to the ease of installation. You will also save time and money utilizing lower cost laborers compared to HVAC and Electrical professionals with our easy installation process. Since 1985, ThermaRay has manufactured Electric Radiant Heating and Snow Melting Products for Commercial, Industrial and Residential Projects around the world. Electric Radiant Heat offers the Lowest Life Cycle Costs of Heating System Ownership, with Lower Capital, Installation and Operating Costs as well as NO Maintenance or Replacement Costs.